Today we will be learning about inventories and their methods! To create an inventory, we will be using the following code below. The first argument, null, represents the inventory owner. In this case we have put it to null because we are not assigning the inventory to a specific player. The second argument, 54, is the size of the inventory. The number must be a multiple of nine due to the amount of boxes in each row. The final argument that this method takes is, "Your Inventory Name" which is considered a string. This is what your inventory will look like. When coding, remember when adding items to an inventory that the first slot of the inventory actually start at 0, making the last boxs position 53. Here, we are creating an new ItemStack of stone with the quantity of 1. We are then declaring an ItemMeta variable as the ItemStack's meta. 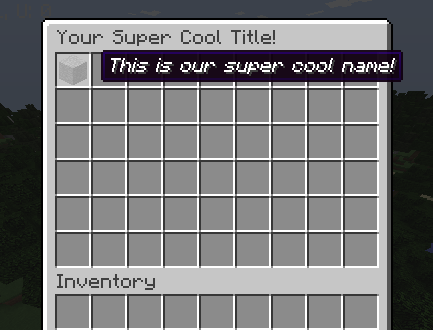 We are then accessing that variable and setting its display name to our string, "This is our super cool name!". // Adding the item to the next available slot in your inventory. Time to give our player our inventory! VOILA! This is our inventory with our custom item in it! This is a list of the different methods along with a description and their modifiers. Stores the given ItemStacks in the inventory. Finds all slots in the inventory containing any ItemStacks with the given ItemStack. Returns a HashMap with all slots and ItemStacks in the inventory with the given Material. Clears out the whole Inventory. Clears out a particular slot in the index. Checks if the inventory contains any ItemStacks matching the given ItemStack. Checks if the inventory contains at least the minimum amount specified of exactly matching ItemStacks. Checks if the inventory contains any ItemStacks with the given material. Checks if the inventory contains any ItemStacks with the given material, adding to at least the minimum amount specified. Checks if the inventory contains ItemStacks matching the given ItemStack whose amounts sum to at least the minimum amount specified. Returns the first slot in the inventory containing an ItemStack with the given stack. Returns the first empty Slot. Get the location of the block or entity which corresponds to this inventory. Returns the maximum stack size for an ItemStack in this inventory. Return the contents from the section of the inventory where items can reasonably be expected to be stored. Returns the title of this inventory. Returns what type of inventory this is. Gets a list of players viewing the inventory. Returns an iterator starting at the given index. Removes all stacks in the inventory matching the given stack. Removes all stacks in the inventory matching the given material. Removes the given ItemStacks from the inventory. Completely replaces the inventory's contents. Stores the ItemStack at the given index of the inventory. This method allows you to change the maximum stack size for an inventory.